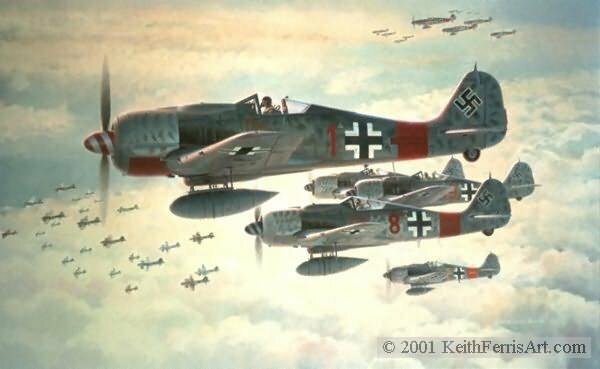 Fw190A-8/R8 "Sturmbock" bomber killers skirt guns of one bomb group as they stalk the lead group. During World War II, the youth of both sides met in the air over Germany, each experiencing the devastating effectiveness of their opponent's weapons. Lt. Klaus Bretschneider, Staffelkapitan of the 5th Staffel of II Group of Jasgdeschwader 300, a specialized bomber destroying unit, leads his staffel past the American B-17s of the 384th Bomb Group based at Grafton Underwood, England. Flying his Focke Wulf Fw190A-8/R8, Red 1, "Rauhbutz VII" (Street Fighter), Bretschneider, with his 17 year old wingman Unteroffizier Mattaus Erhard to his right, positions his staffel to attack another targeted American unit up ahead. While the Americans faced the German 20mm and 30mm cannon of II./jg 300, these airmen faced the combined fire of 13 50 caliber machine guns amd 9,000 rounds of ammunition in each B-17 in the large American formations. Each side recognized the other as "Real Trouble"! 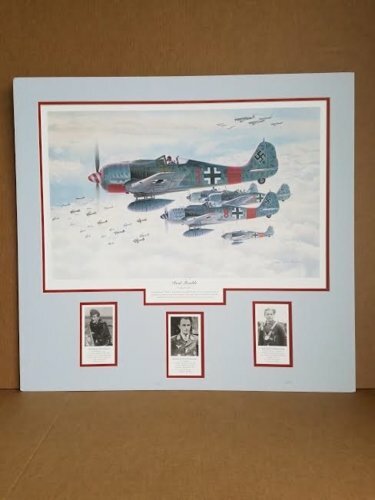 Research for my National Air & Space Musemum B-17 mural "Fortresses under Fire" led to a continued interest in the defending German fighter units and their pilots. This painting joins other Ferris paintings of this subject.